Philosophy is best known here at amouraimee.com for its amazing fragrance sets and skin-saving face and body creams and lotions. We’re turning all our attention to their newest set though, available this month, as it’s truly a vacation in an adorably coconut-adorned package. Included in the vanilla coconut scented set is their famously popular and award-winning 3-in-1 shampoo, shower gel and bubble bath, a rich and smoothing body lotion and a super shiny and moisturizing lip gloss, because ‘coconut kisses are a tropical temptation’. Fluffy, yummy bubbles gently cleanse and soften skin and hair, and when followed up with the lush yet fast-absorbing lotion, you’ll be left with comforted and cushioned skin that smells so good, you’ll have a hard time not closing your eyes, inhaling deeply and enjoying a pick-me-up better than any french pastry. Even better on your lips is the high-gloss, high flavour lip shine. Long-lasting lustre packs a beautifully shiny punch, while sunflower seed oil deeply hydrates. 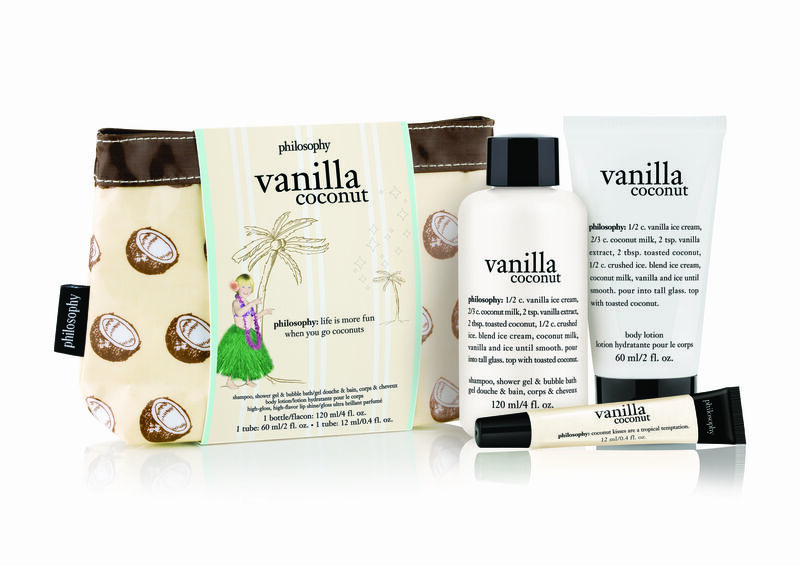 True to their ‘Philosophy:‘ packaging with a description on each bottle pertaining to each individual scent, vanilla coconut (just like their ever-popular fresh cream scent) divulges a splurge-worthy recipe for a smoothie with ingredients like toasted coconut and vanilla ice cream. To indulge totally guilt-free, nothing beats this delectable set that delights all senses.